Recently I decided to take the advice of a good friend and start posting on my Facebook page and my Twitter feed quotes that are meaningful to me superimposed on photographs that I've taken. The combination of an image and a powerful quote seems to have found a strong connection with my audience. Churchill's quote says many things. It raises the concept that someone's best may not always be good enough in life. That's true and can be a depressing realization. But the quote also inspires by demanding us to push past what we consider our best and do what is ultimately required in a given situation. That would establish a "new best" for ourselves. It gets us to achieve more than we originally thought possible. And that is one of the missions of a mentor. A notion that pops up often in my mentoring conversations is the idea of fairness, or rather the lack of it, in life. A typical exchange I have will center around a mentee's disappointment about being passed over for a promotion or perhaps getting a smaller than expected raise. I listen quietly as the mentee describes for me their list of truly impressive accomplishments ending with the inevitable complaint of feeling unappreciated despite doing their level best. When I'm asked my thoughts about the situation I reply in some fashion that while it may have been their best the effort was by definition insufficient to attain their goals. I go on to ask what was the gap between their best and what was required. I recognize that not everything is in our control yet this exercise proves extremely useful. Most of the time it leads to a productive conversation. The mentee arrives at some realizations and a clear set of next steps to improve the situation emerge. Brainstorm with the mentee about actions that could have helped them reach their goals but may not have been obvious. For example, was there a relationship they could have cultivated that would have lent support for their promotion? Or we may look at whether a career change is required to achieve their goals. Guide the person towards being grateful for what they already have. Gratitude can be a potent balm. 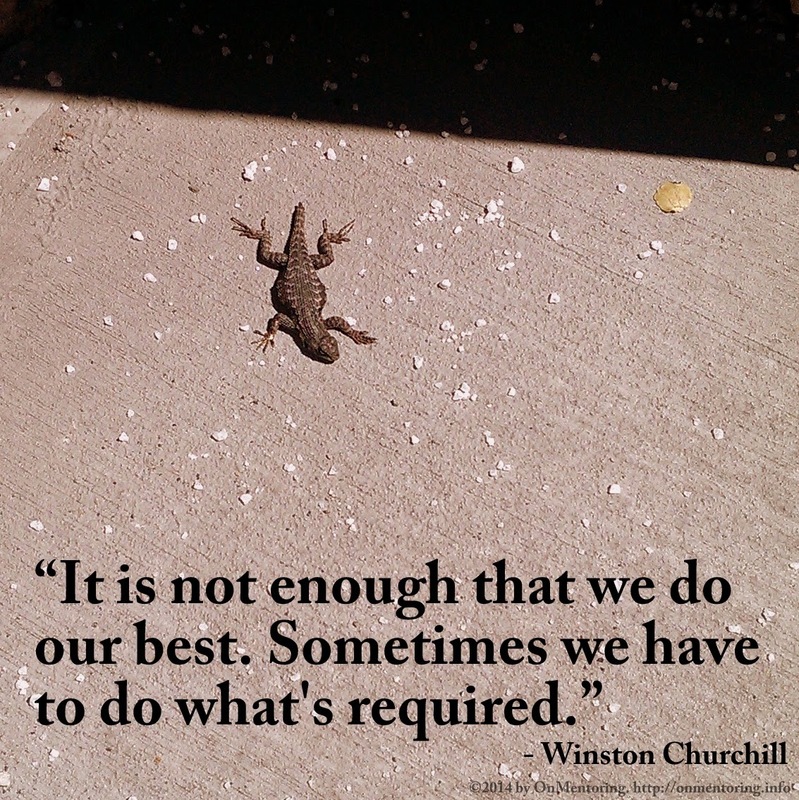 The reason I chose that particular photo above to match this quote is because I had constructed a story around that little salamander at the time I snapped the picture. It was a very hot day and he caught my eye as I was walking quickly by looking for some shade for myself. As I fumbled for my cellphone camera I was telling myself that the salamander must be cooking on that searing concrete. He had to be having a tough time. He was probably looking for some food or even more likely something to drink. Those sharp white pebbles all around him would certainly not make his hunt any more pleasurable. I imagined that he must be thinking he's doing his best to get to what he needs but he's simply not catching a break - heat, pebbles and no water in sight. But if he's going to survive he's going to have to go beyond his best, deal with the situation at hand and do what's required. When I found my shade I still thought about that salamander and how much luckier I am than he. But neither he nor I nor any of us can fully escape situations when we simply have to do what's required to get what we want or what we need out of life. I wish for us all the fortitude to go and do just that.